Track Constants™ – First defined by Charles Carroll in the book Handicapping Speed, after years of development can now be applied to almost every distance at every track in North America using Speed Handicapper® v6.0! Tracks have certain physical characteristics that affect the times that are recorded on them, ranging from one-jump flying starts, to the downhill Santa Anita “about” 6.5f course, which is the most extreme example in North American racing. These “Constants” were originally described by Charles Carroll in the book Handicapping Speed—but, short of visiting every course with an engineer’s transit, there seemed to be no solution—until Carroll finally cracked the problem in 2005. Now the Track Constants are calculated using a proprietary method and updated annually for Speed Handicapper® v6.0 users. Track Constants™ on the Ground: Timing for all Thoroughbred races actually begins when the first horse reaches the Starting Pole—but there is no rule for the distance from the gates to the pole. 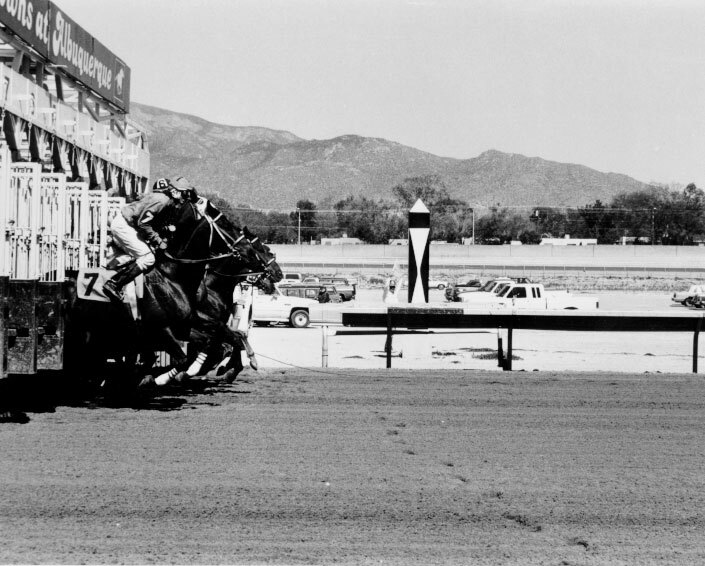 Tracks generally place it at around 30 yards—but it can increase up to 60 yards—or down to virtually ZERO—as in this 1m 1/16 start at the Downs at Albuquerque. This is not a Variant! It is a constant. Yet other gate run-ups on the same track range from average to very long. How can you account for this with speed figures? Use Track Constants™!